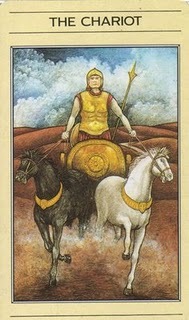 Today's Draw: The Chariot from the Mythic Tarot. How many conscious choices do you make in a day? How many unconscious ones do you suppose you make? What do you think you could gain by becoming more conscious of the choices you make each day? There are many ways to read The Chariot. One meaning is about balancing forces, such as dark and light. Another way to read The Chariot is about reigning in opposing forces so everything moves forward smoothly. Some read it to mean momentum toward goals or taking control of a situation. But whenever I see this Chariot in particular, I always think about being pulled in two directions. In countless little ways every day, we're given the choice between moving toward our higher selves or indulging our more base desires. It's that split second choice you make when the elevator door is closing and you see someone running toward it. Whether or not you let a car merge in front of you in traffic. Whether you smile at a passer-by or divert your eyes from them. Every single one of those things weights one side of the invisible scale in your soul or another. It's not always a choice between your dark side and your light side. But I do think there's always an option that will lift you higher, whether it's obvious or not. The things we do are not the only choices we make. The things we think or say...what we choose to see...how we respond emotionally...all those things are choices too. Most of us go through the day on automatic and maybe we won't even notice one of hundreds of choices we're making between the time we wake and the time we sleep. We just kind of go along the way we always have, not even recognizing that every choice we make is also an opportunity to feed our divine spirit. The more conscious we are of the choices we make, the more power we're able to have over our spiritual, personal, romantic, sexual, financial, familial and career trajectories. Another thing I see in this Chariot card is like being at a fork in the road with one horse moving down one path and the other horse taking the other fork. Around the world there are human, environmental and financial shakeups pretty much everywhere you turn. When things start falling apart, it's usually a good sign that it's time to change. Some will stay at the crossroads in the rubble for as long as possible. Some will retreat back into old habits and continue to suffer shakeups. And some will move forward with a lesson learned. I can't explain this but to say I feel it within me each time I've written these blogs lately...the time is now. We can't sit on the fence any longer. Either we keep making the same choices or we start making more choices that lift us up and move us forward. It all starts with recognizing that you have a choice in the first place. You made probably at least a hundred—if not a thousand tiny little choices—today. How many of them were conscious? How many of them were purposely made to move you forward? Once you start making conscious choices, then make a habit of choosing the higher one. You won't always be 100%. That's OK. But you can decide, for example, that every time you make eye contact with someone, you will smile from now on. And if you have an off day, that's fine. But as long as you're going to move on automatic, why not move forward with the automatic choice that serves your higher self? An old Cherokee is teaching his grandson about life. "A fight is going on inside me," he said to the boy. "It is a terrible fight and it is between two wolves. One is evil - he is anger, envy, sorrow, regret, greed, arrogance, self-pity, guilt, resentment, inferiority, lies, false pride, superiority, and ego." He continued, "The other is good - he is joy, peace, love, hope, serenity, humility, kindness, benevolence, empathy, generosity, truth, compassion, and faith. The same fight is going on inside you - and inside every other person, too." The grandson thought about it for a minute and then asked his grandfather, "Which wolf will win?" The old Cherokee simply replied, "The one you feed."